Brighton, UK 4-piece Metronomy are slated to deliver their latest, The English Riviera, to stateside audiences April 19th on Because Music/Big Beat/Atlantic. Their most polished effort to date, The English Riviera is an ambitious attempt to navigate the tidal swells of love and life, abjectly melancholic and passionate, celebratory of it’s outstanding potential to evoke polarizing feelings simultaneously. Helmed by multi-instrumentalist Joseph Mount, Metronomy’s 2008 sophomore effort, Nights Out, appropriately demonstrated a subdued, adolescent after-hours wonderment. The album wore its heart on its sleeve and lipstick on its collar, characterized by deviant intrigue that placed the record amongst the more critically acclaimed English dance albums of the late 2000s. The English Riviera, the band’s third proper full length, is marked by a notable lean toward late-nineties indie-pop aesthetics, incorporating a diverse array of percussive and melodic elements. Anchored by the lead single “The Look” (which saw remixes from red Falke, Moonlight Matters, Ghostpoet, and King Krule), the album seldom strays from deliberately danceable yet contemplative arrangements. Combined with the withdrawn harmonies of members Anna Prior, Oscar Cash, and Gbenga Adelkan, the result is a personal yet wholly involved group effort, isolated while amongst one another, each member a wayward sailboat on a glassy sea. Since the first Cage the Elephant debut in 2009 they have re-invented themselves. Their new sound is not having just one sound in particular. Cage the Elephant is a mix of blues, retro and futuristic rock. During the two year gap, the band managed to record 80 new songs, 12 of which are on Thank You, Happy Birthday. Although they had a more subtle and retro-funky sound when they first started, Thank You, Happy Birthday, took a different turn this. The change didn’t settle to well, seems like everything that was initially set in place to be their sound came to a halt for a new experiment. Their new sound, although uneasily loud and somewhat considered racket, pushes the point of their new songs. Sell Yourself and Indy Kidz are two songs on the album that really push the idea of individuality among teenagers and fighting against the stereotypical television physique and quota appearance. With a message like that, the new sound is quite suiting. Though the sound suited some songs, the entire album was far too mixed. From the soothing indie music sounds to punk rock, it hardly meshed together. Assuming the sound would have stayed the same, the heavy rock bass guitar definitely didn’t have a welcoming affect. 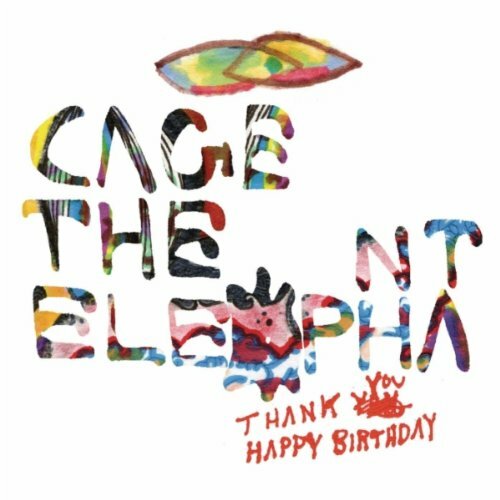 With such a torn feeling about the dark and bitter sound, there is a definite love-hate relationship with Thank You, Happy Birthday. Love moments come with classic indie sounding songs like Rubber Ball and Flow. Flow has a little reminiscence of something Death Cab for Cutie would do, with less of the emotional overfilled lyrics. These acoustic ballads did wonders for toning down their new style making it acceptable, in small doses of course. Cage the Elephant did however keep to their initial idea of radio friendly material. Shake Me Down, the number one single continues to keep their previous sound alive. This leads to the question, why does only half the album scream what fans recognize as Cage the Elephant? Thank You, Happy Birthday has great aspects to it, although becoming a number one billboard topper is hardly seen in the future. Cage The Elephant haved put forth some great individual songs, and an attempt at worthwhile new material. Perhaps separating the songs would have made for a far more consistent album, but there are no should have, would have, could have’s in the music world, only next times. Hopefully next time there will be some more original sounding Cage the Elephant seeping through the music.